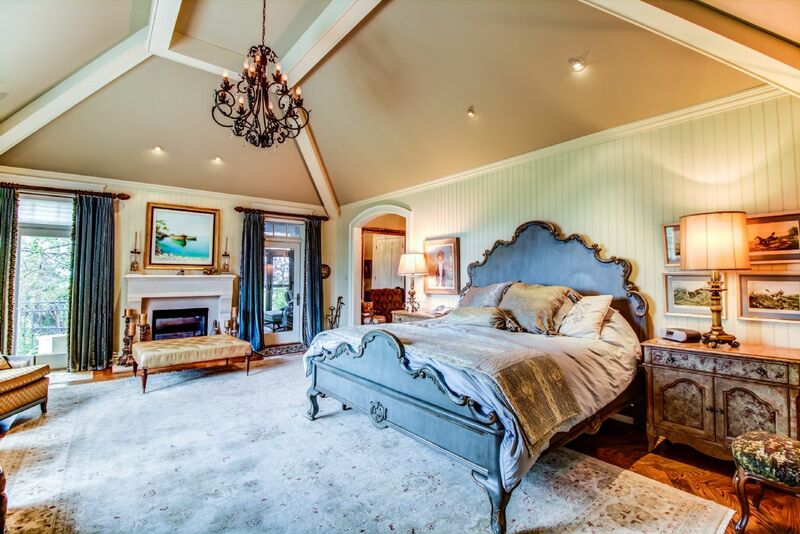 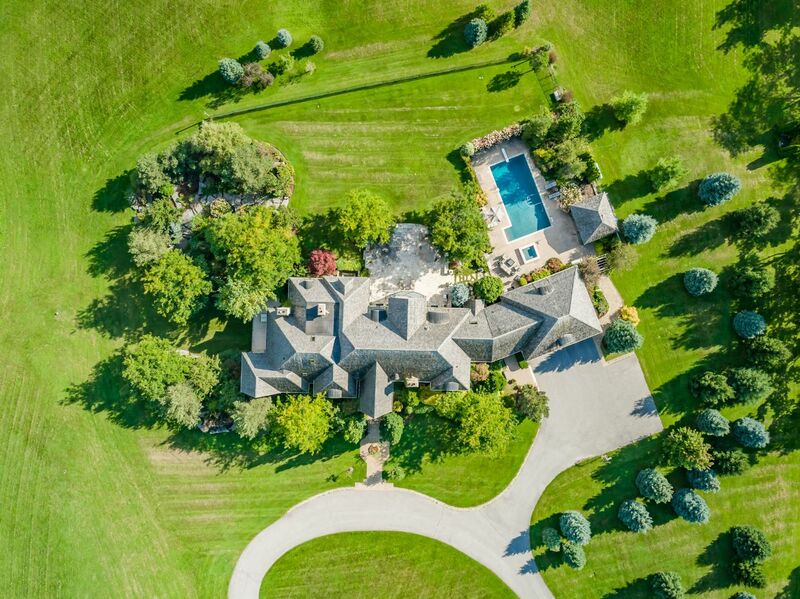 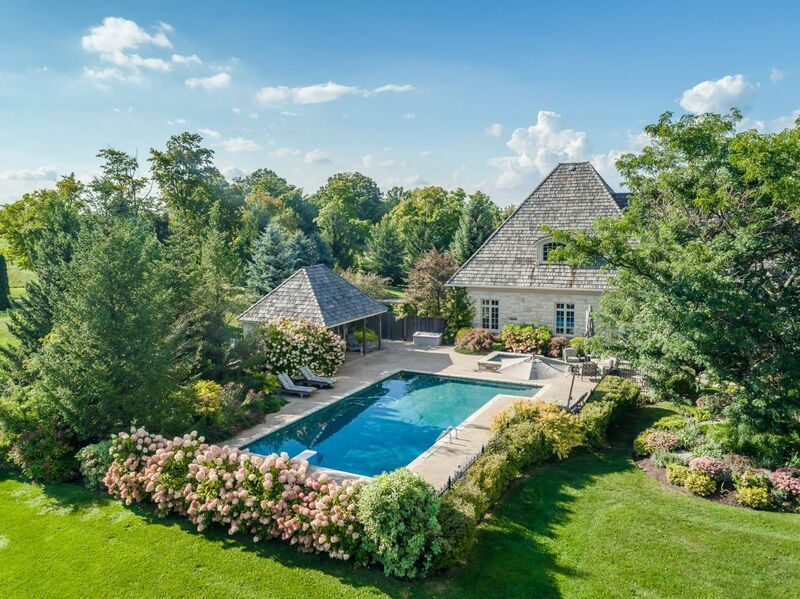 An exceptional custom home built on 92 acres. 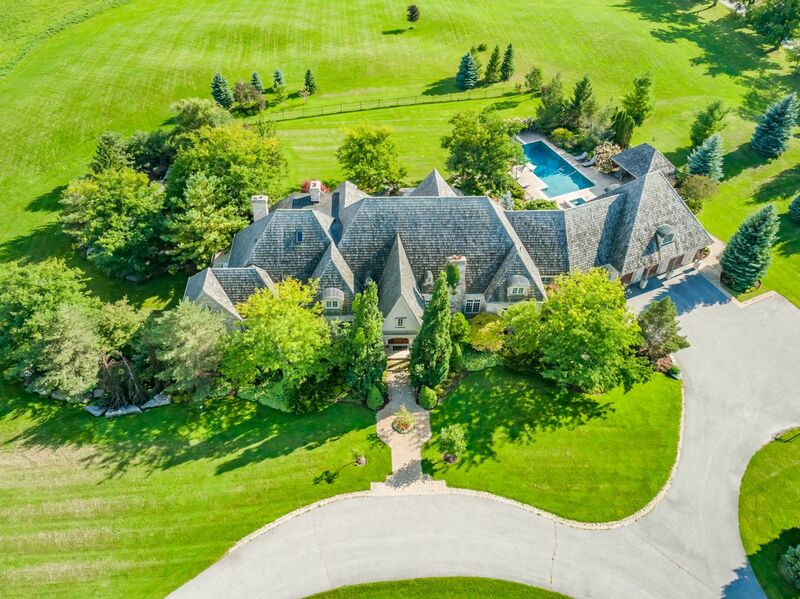 First time ever offered. 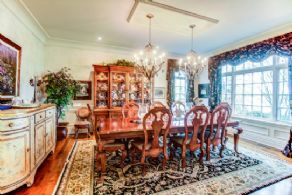 This elegant country home is perfectly positioned in the rolling hills of King within 5 minutes of Yonge Street, St. Andrew’s College and The Country Day School. 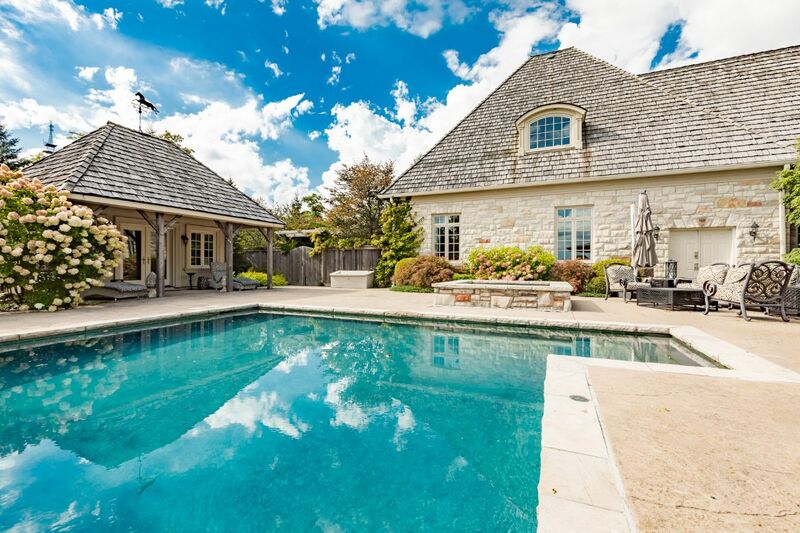 One of the best locations available! 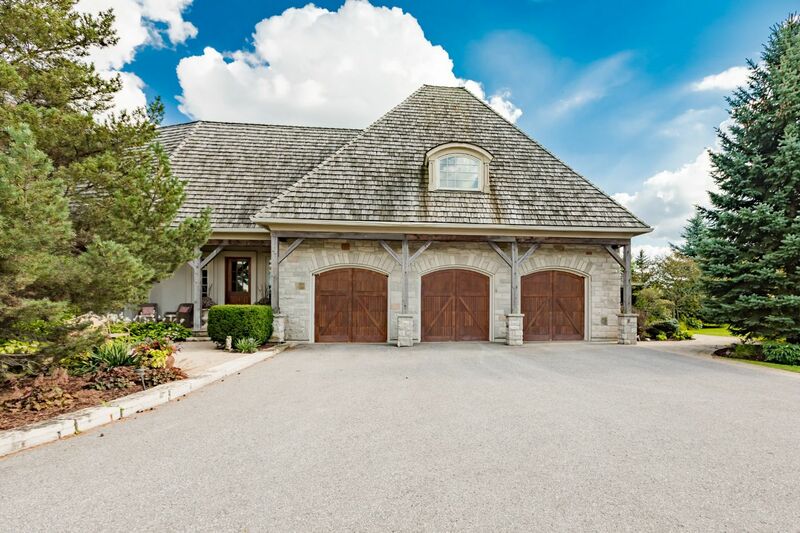 The home was built for the current owners on a high point of the 92 acre property on a site with distant views over the Town of Aurora and King. 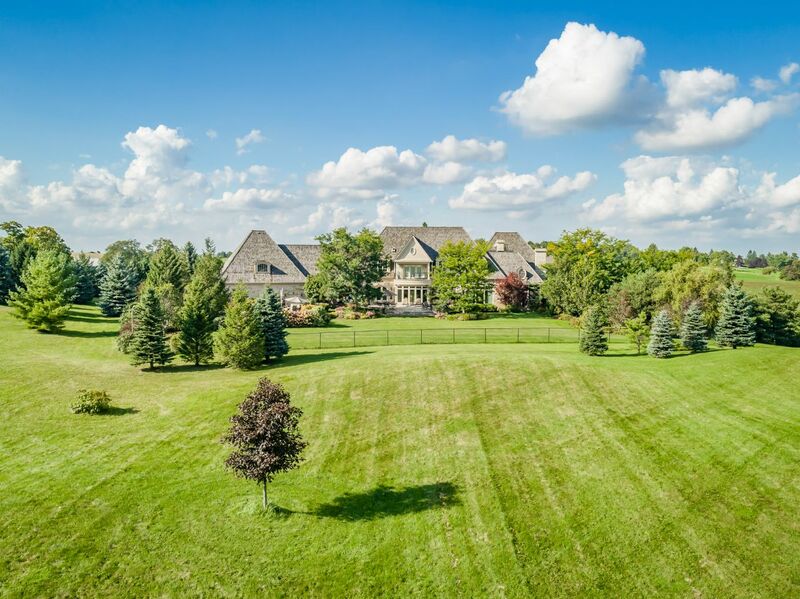 The long gated driveway is majestically lined with century-old maple trees. 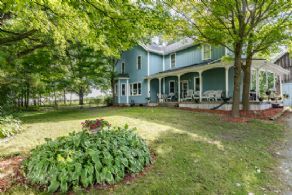 In addition to the main house, there is a well-maintained second home, plus a stable with arena and several useful outbuildings. 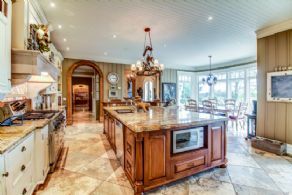 The home was built by one of Toronto most well respected builders (Windemere Homes) with interiors created by a top interior design firm. 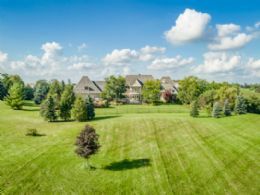 The property enjoys extensive paved road frontage with mature trees and gardens plus open rolling lands. 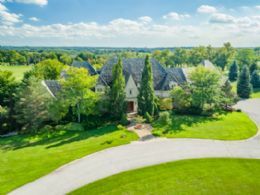 The wide foyer welcomes guests into the home and opens into a large entertaining space with bar and direct walk-out to the south facing stone terrace. 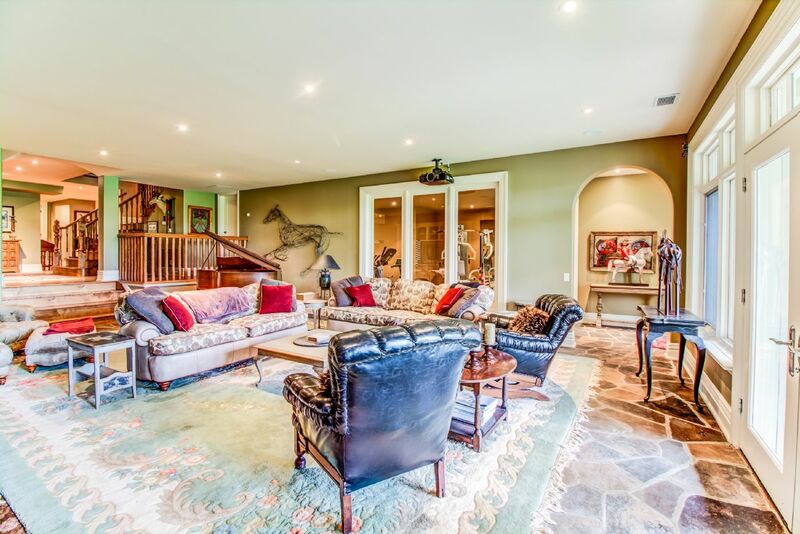 The foyer has a vaulted beamed ceiling and wide format stone floors. 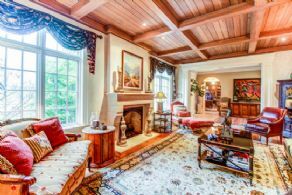 Off the foyer is the living room with beamed ceiling pot lights, gas fireplace, and large picture windows looking over the property. The large living room opens directly into the formal dining room and is perfect for entertaining. 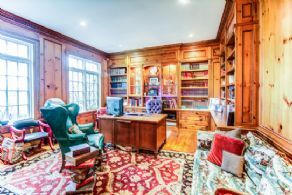 Across the foyer is the owner’s office which is richly panelled and lined with floor-to-ceiling cabinets and book cases. 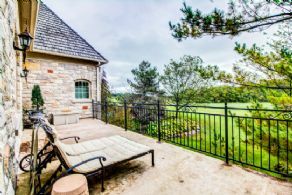 The large picture windows offer countryside views. 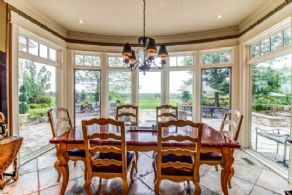 The dining room is finished with wide-board wood flooring and well-crafted millwork and is placed alongside a large servery. 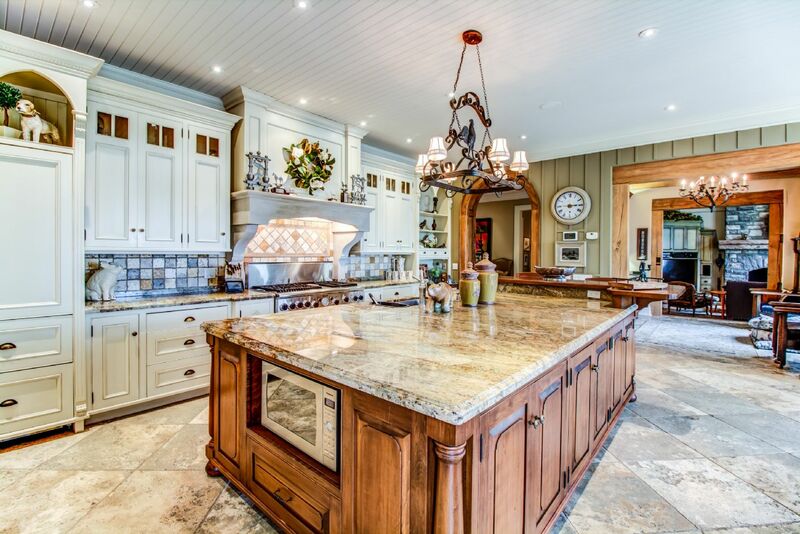 The servery has granite counters, sink and additional storage. 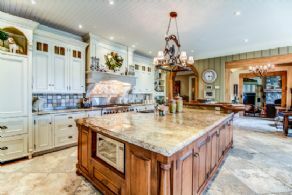 The large country kitchen looks south through massive floor-to-ceiling windows which flood the area with natural light. There is a breakfast area plus additional seating at the large centre island with its expansive granite counter. 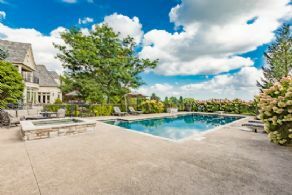 The kitchen opens directly onto the stone terrace and pool area which is wonderful for warm weather dining and entertaining. 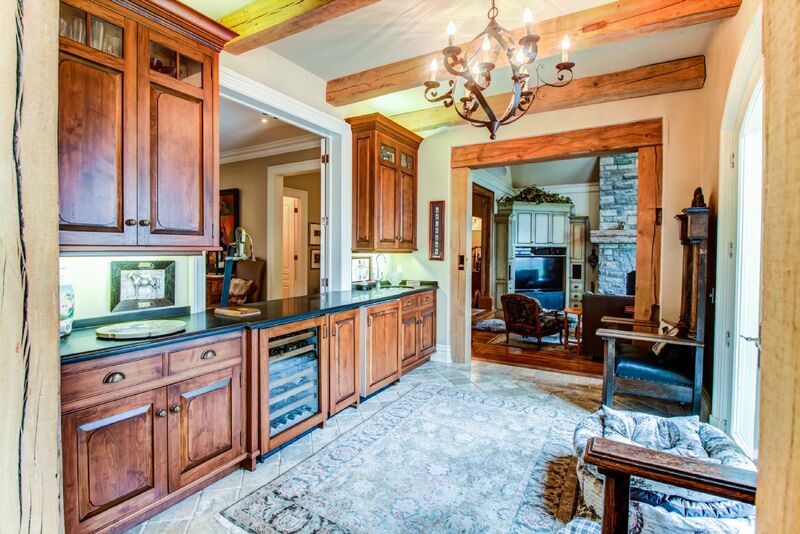 The kitchen has ample cabinet storage space in addition to a well-organized walk-in pantry. 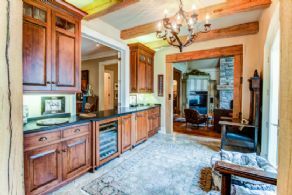 The panelled ceiling, large format stone floors, views, and the warm design colours make this kitchen a favorite space in the home. The 2-storey family room offers views to the south and west and has a large stone fireplace. 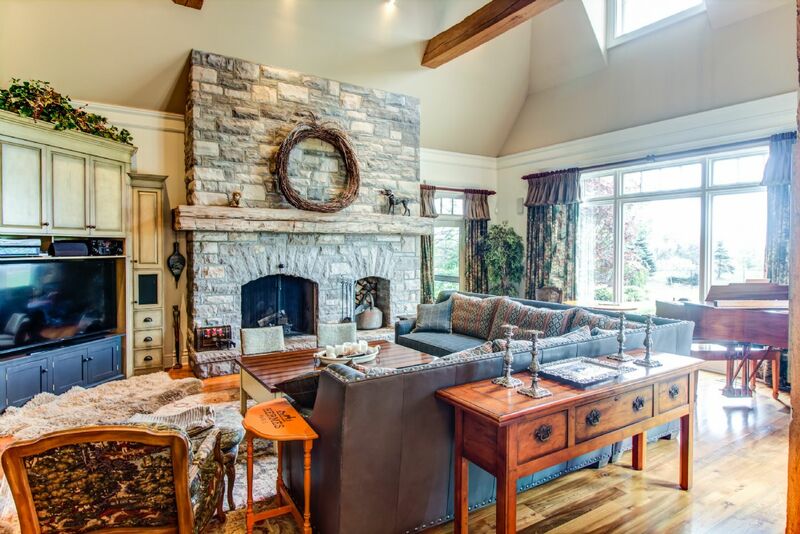 The antique reclaimed barn beam mantel over the fireplace complements the beamed ceiling. The family room is well positioned and offers access to the outdoor entertaining spaces and the Muskoka Room. 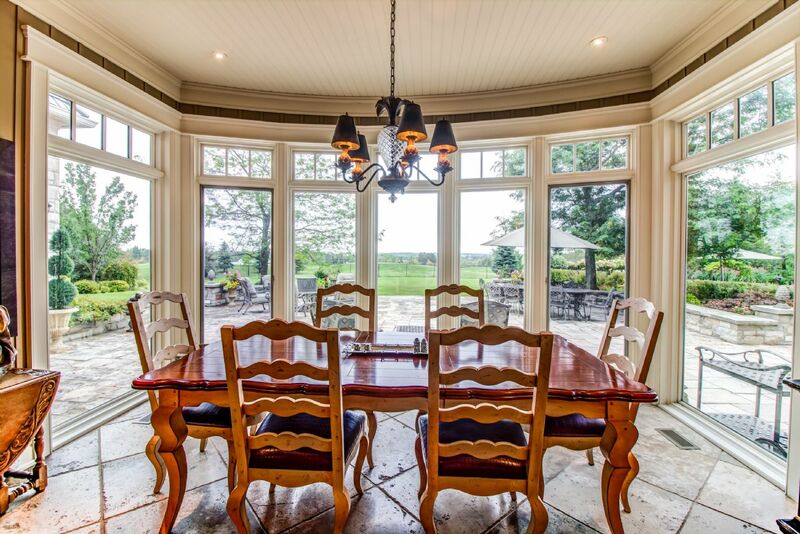 The screened Muskoka room has a vaulted tongue and groove ceiling with built-in sound system. This causal room has stone floors and is a great place to relax and enjoy the peaceful surroundings and gardens. 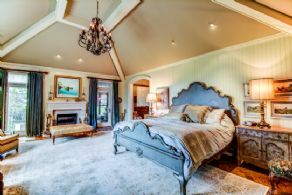 The private master suite has a full change room, a walk-in closet, 5-piece en suite with heated floors, fireplace, vaulted ceilings and a walk-out to an east facing deck which offers morning sun and a view towards woodlands. 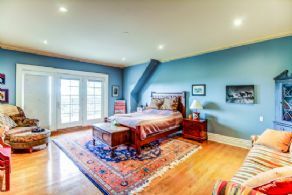 The comfortable master bedroom has a seating area, large picture windows, a fireplace and high beamed vaulted ceilings which adds scale to the room. 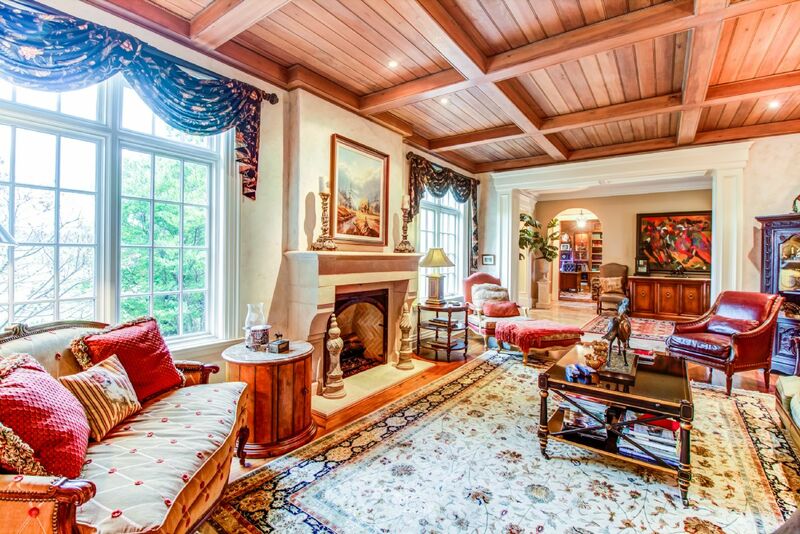 The master also enjoys direct access to the Muskoka room. 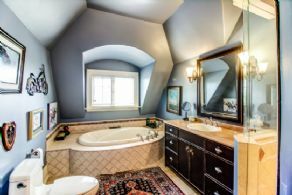 At the west end of the home is a main floor laundry with slate floors plus a storage room and large mudroom with full three piece bathroom. 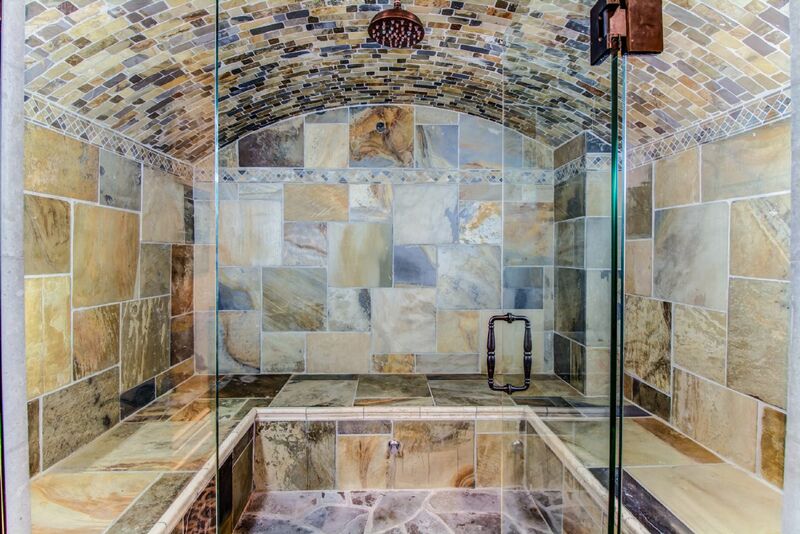 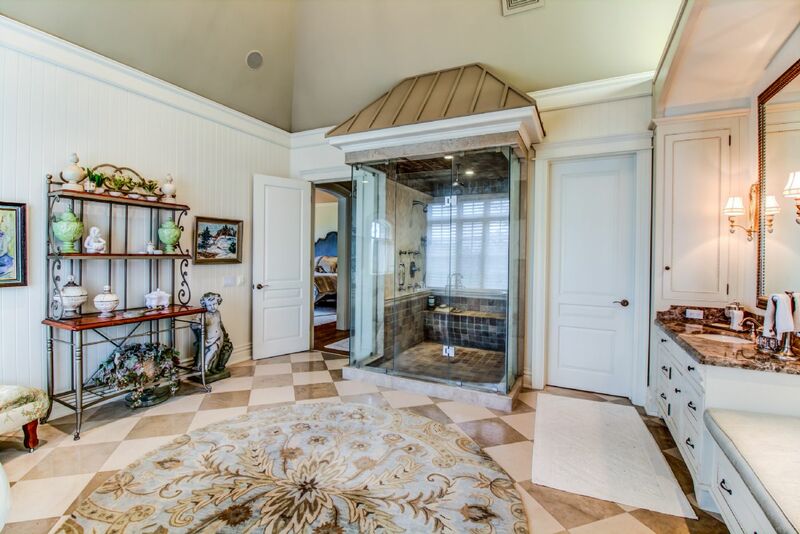 This area of the home has direct access to the outdoor hot tub and pool area and to the 3 ½ car garage. 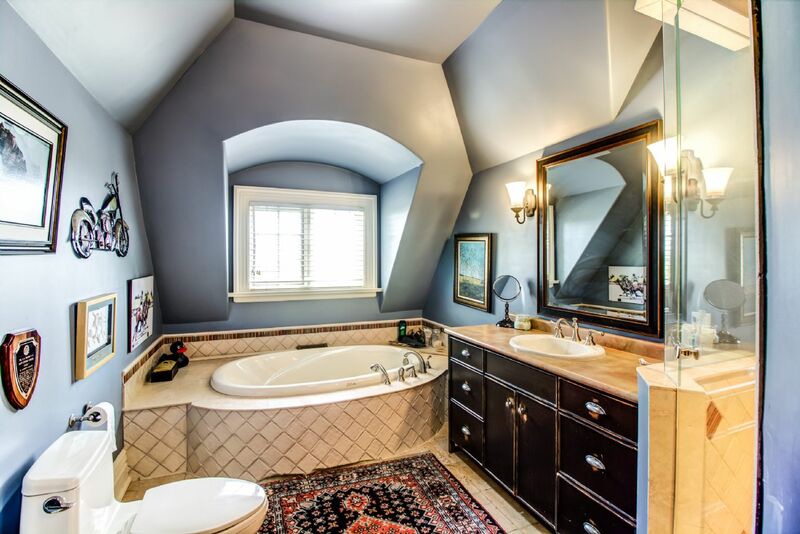 The main floor also has a 2-piece Powder Room off the main stair and a 3-piece washroom off the Mud Room. 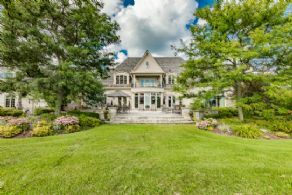 The well thought-out floor plan has 2 staircases leading to the second floor and 2 staircases leading to the walk-out lower level. 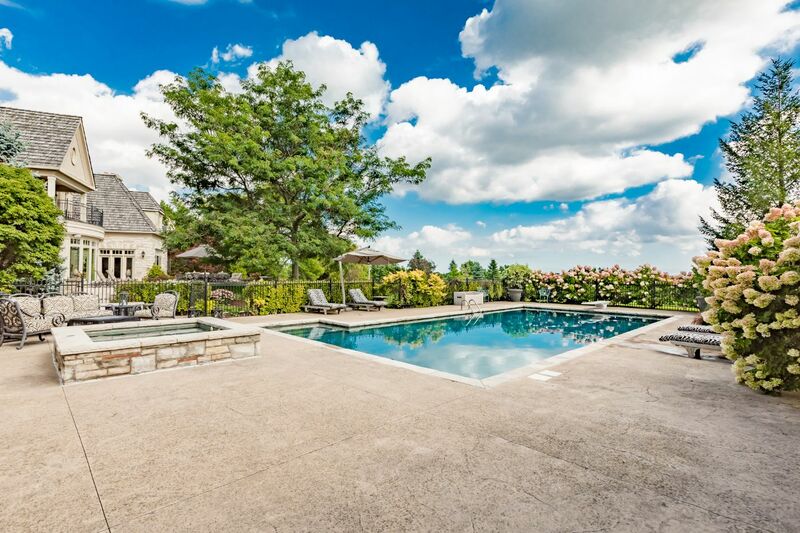 The second floor has 4 bedrooms and 3 baths and views over the surrounding countryside. 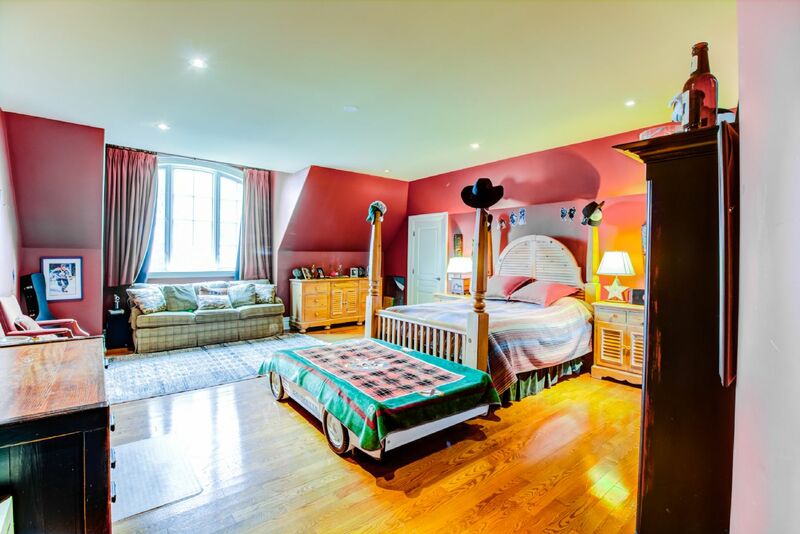 Bedroom 2 has hardwood floors and an en suite bathroom with heated floors, glass shower and soaker tub. 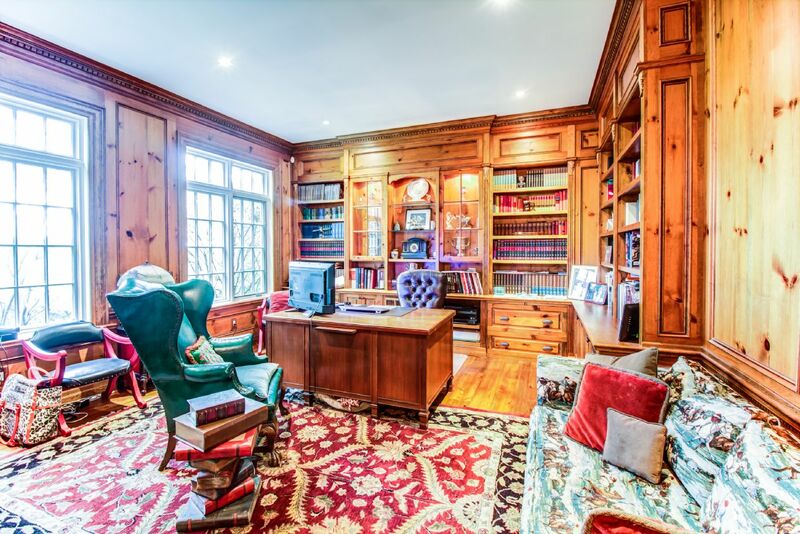 This room has a walk-in closet and a direct staircase to the mud room. 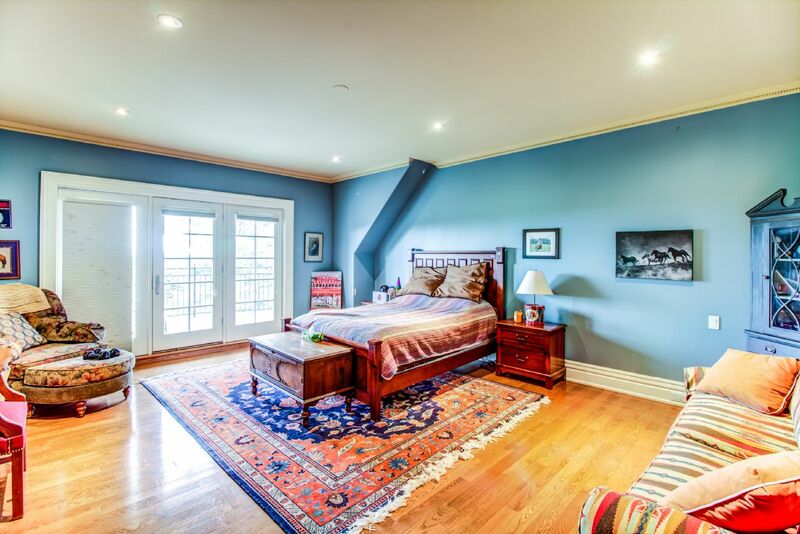 Bedroom 3 has a walk-out to a south-facing sun deck with long views. 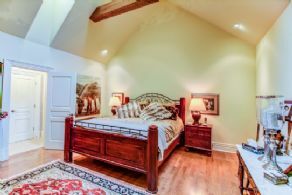 The bedroom is finished with hardwood floors, pot lights and large walk-in closet. There is a 4-piece en suite bathroom with heated floors. 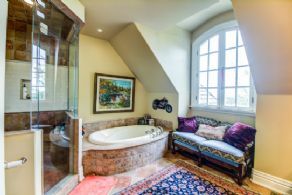 Just to the east of the main staircase is the guest area of the home with 2 bedrooms and a 3-piece bathroom with glass shower and heated floors. 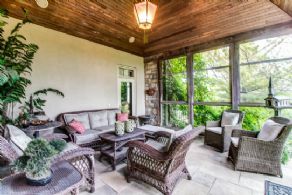 The guest area has vaulted ceilings and hardwood floors. 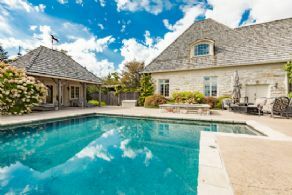 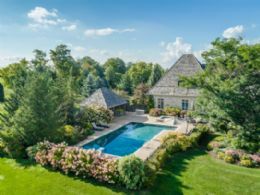 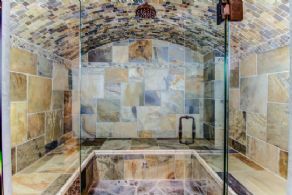 The well-finished lower level has a nanny suite, billiard room, home gym, media room, stone fireplace, bar and 3-piece bathroom with steam shower plus a sewing room. 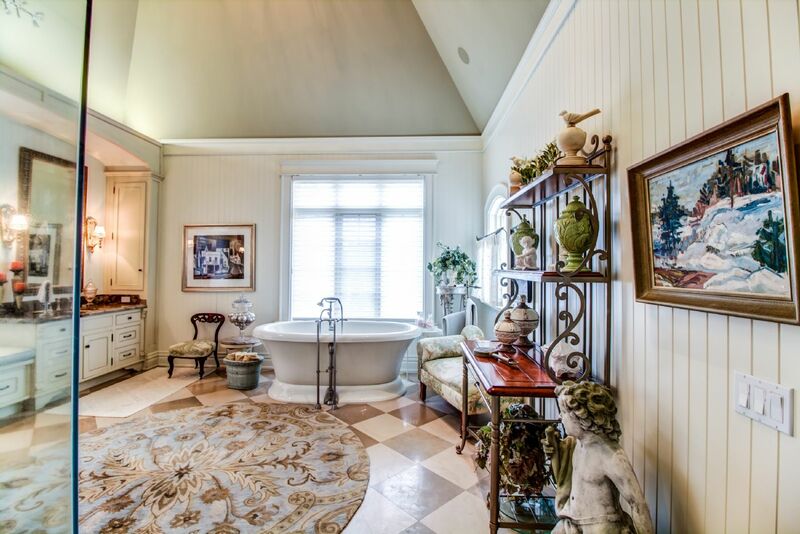 Also on this level is a walk-in cedar closet, several storage rooms and utility rooms. 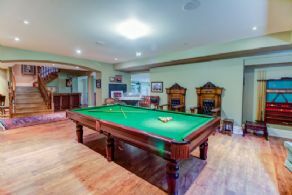 The large billiard room is located at the bottom of the main stair and looks over the media room. One end of the billiard room has a bar area. The media room has a large stone fireplace and an automatic retracting screen which lowers from the ceiling above the fireplace. 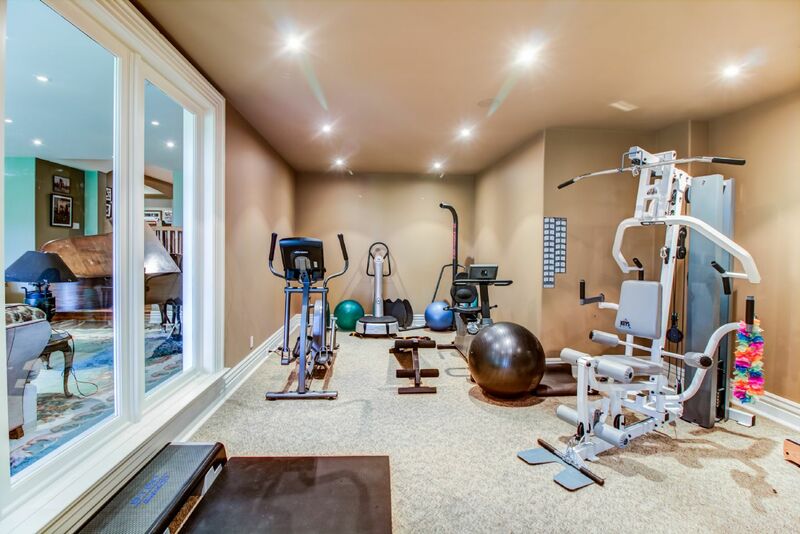 This large room has a walk-out to the grounds and is located beside the home gym and change room/bathroom. 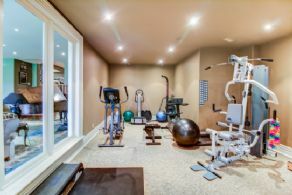 The home gym has a wall of glass which lets lots of natural light into the space and also allows one to see the large projection screen when exercising. The home gym has steam room/bathroom/change room. 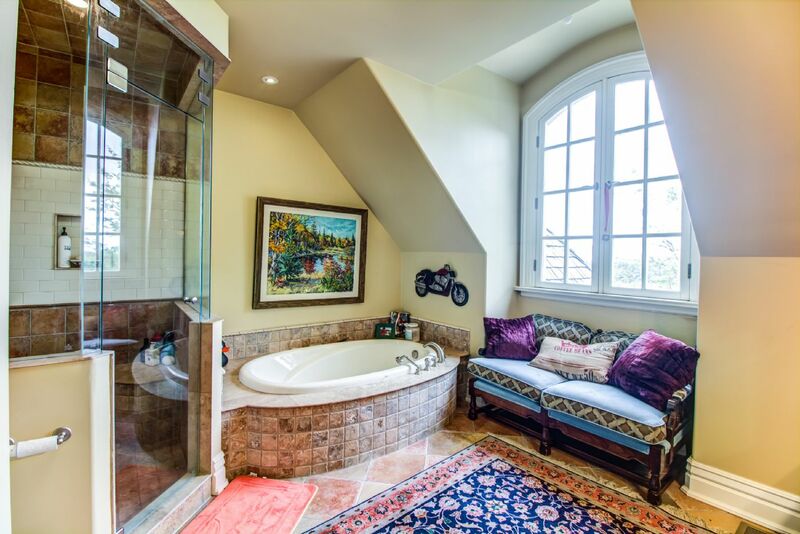 The west side of the lower level has its own private staircase which leads to the nanny or guest suite. 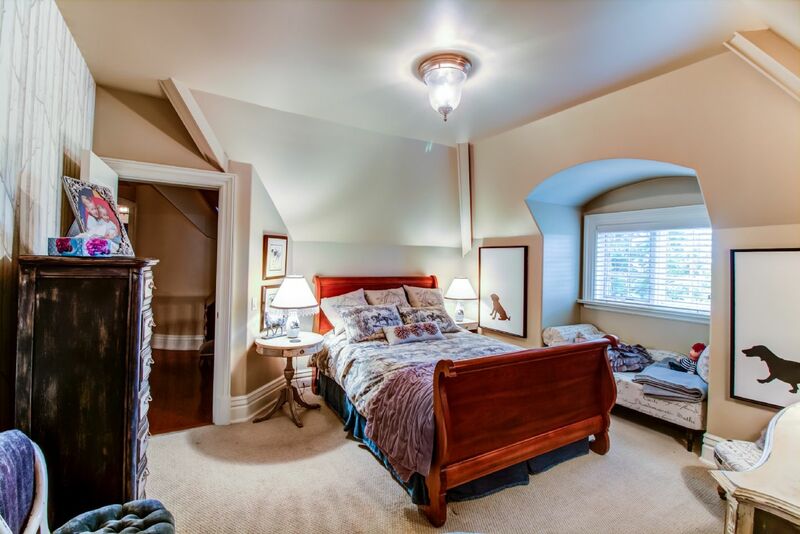 This suite has a large walk-in closet, bedroom with window and a four piece en suite bathroom. 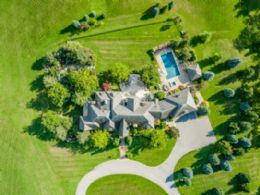 The second residence was the original home on the property which has been upgraded and it is well positioned to the west of the main driveway. 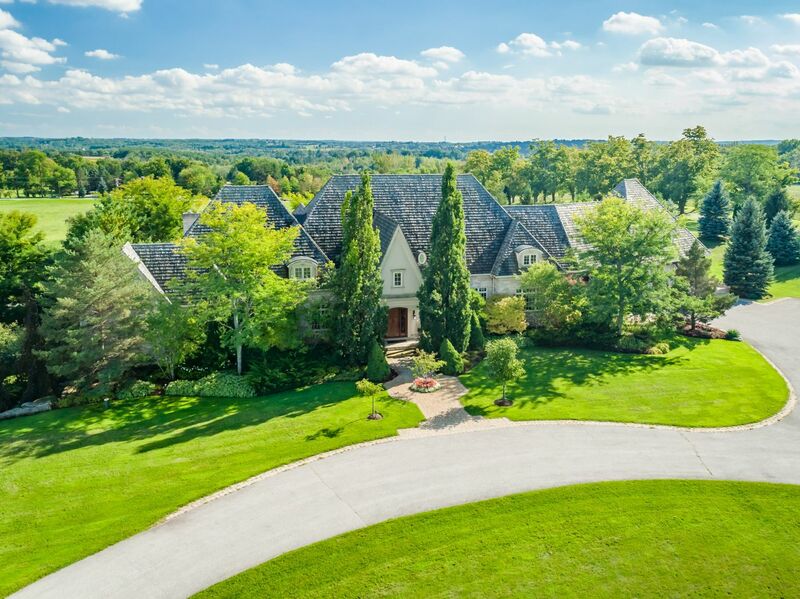 Mature trees surround the home and offer total privacy. 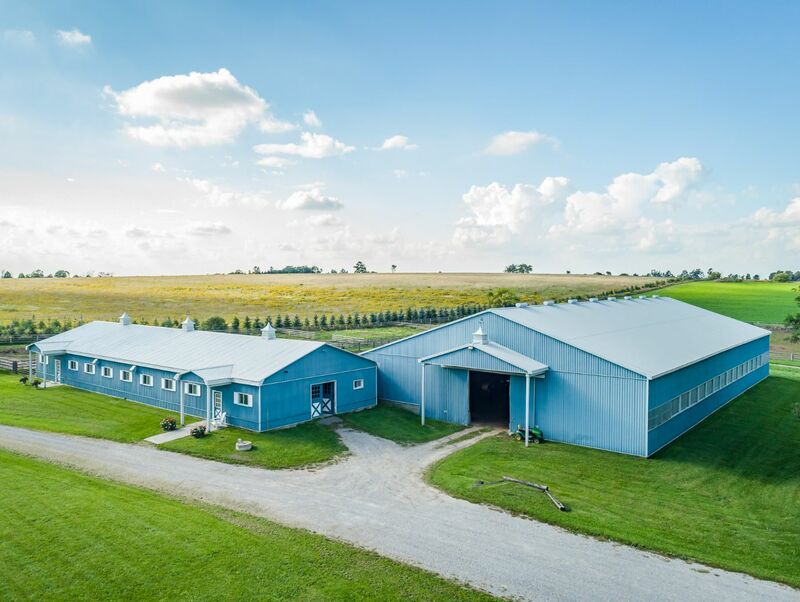 The barn has 17 stalls, bathroom, tack room, wash stall, laundry and an attached indoor riding arena. 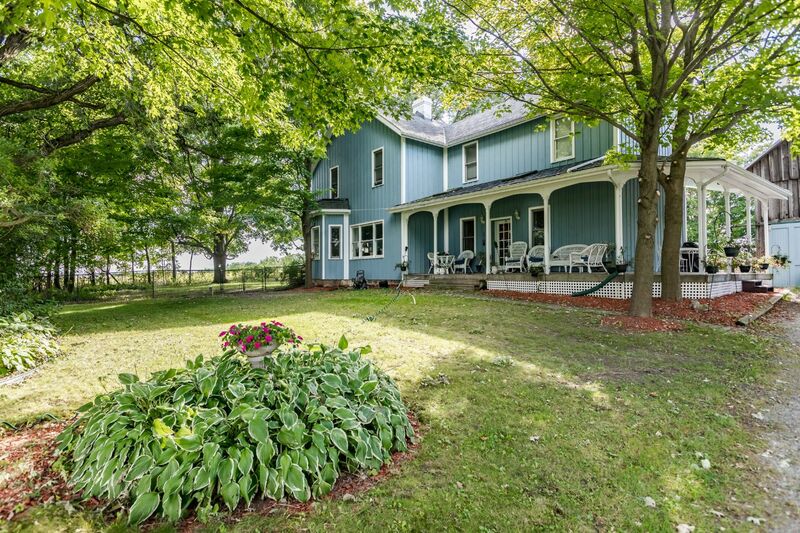 This stable complex could be leased out to an area horse professional to produce income, if desired. Alternately, the stable can be used for an owner’s own horses or used for other recreational/hobby purposes. 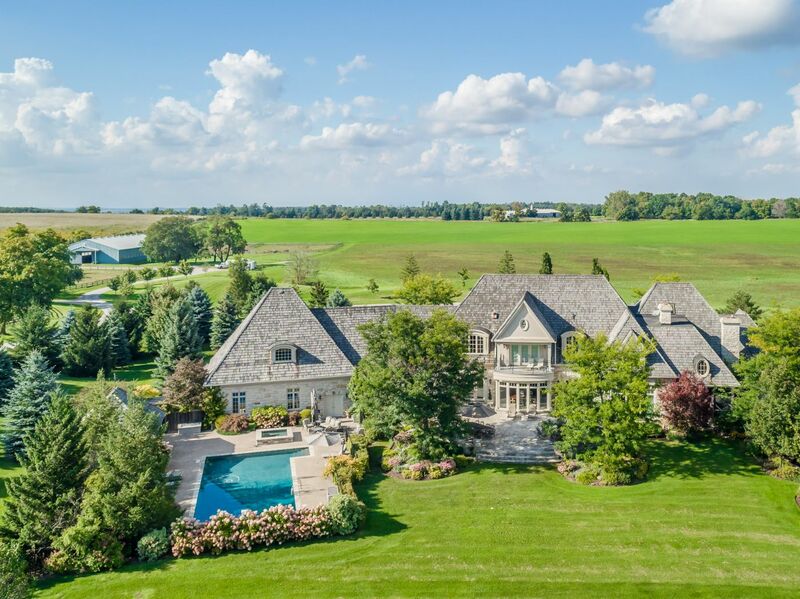 Ample paddocks and hayfields surround the stable. 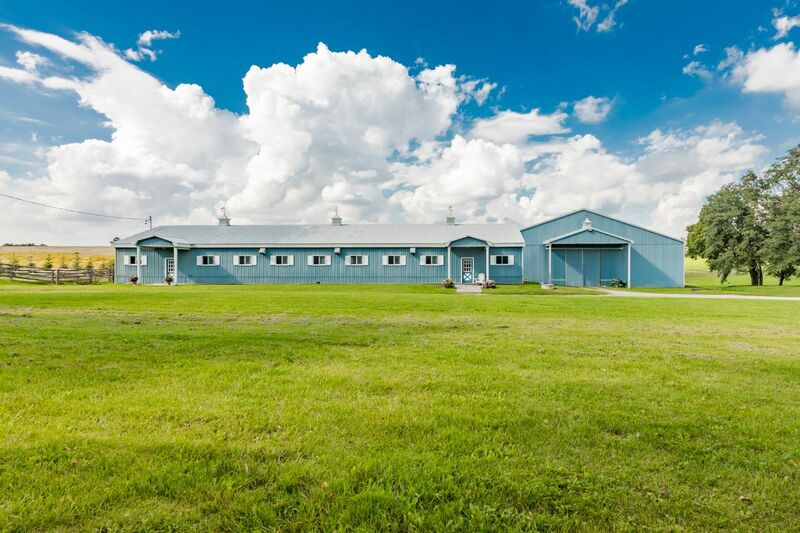 There are two large outbuildings between the second house and the stable which offer ample storage/workshop space.